Do you want to work for a global insurance leader and get the opportunity to learn from the top professionals in the industry? Zurich has launched the Apprenticeship in Insurance Practice, a three-year training and work experience programme for up to 10 candidates. Zurich Insurance has announced the launch of its dedicated Apprenticeship in Insurance Practice. The Programme is designed to offer school-leavers and job seekers the opportunity to secure a three year training and development opportunity with Zurich at its centre of excellence in Wexford. The Apprenticeship, which is accredited by the Insurance Institute of Ireland (III) and Sligo IT, is now available for online applications, with an information day taking place on 9th May at 11am in our centre of excellence in Drinagh, Wexford. Initiated by Zurich and developed by the insurance industry and the III, the programme will focus on developing learners' core skills through on the job experience and an extensive range of world-class training supports. Chosen apprentices will work towards achieving their Professional Diploma in General Insurance and go on to secure a Level 8 BA Honours Degree in Insurance Practice. In addition to professional training during their placement, successful applicants will experience first-hand the skills required to work within Zurich's various business areas by completing rotations in Underwriting, Claims Handling and Direct Client Advice, before specialising in one area for their final year. The Apprenticeship forms part of Zurich's commitment to develop initiatives in the communities in which they are located. The programme is aimed at helping people looking for an alternative to university life. Candidates are given a chance to earn and learn at the same time, get experience in various departments within the business, and work with some of the top professionals in the insurance industry. Applications will be accepted from 24th April 2017, following which an open information day will be held by Zurich's offices in Wexford from 11.am-1pm on 9th May. The event, for which attendance is optional for interested candidates, will provide information around the selection process and answer questions about the programme. For further information about the Apprenticeship in Insurance Practice, or to submit an application, visit our careers website. 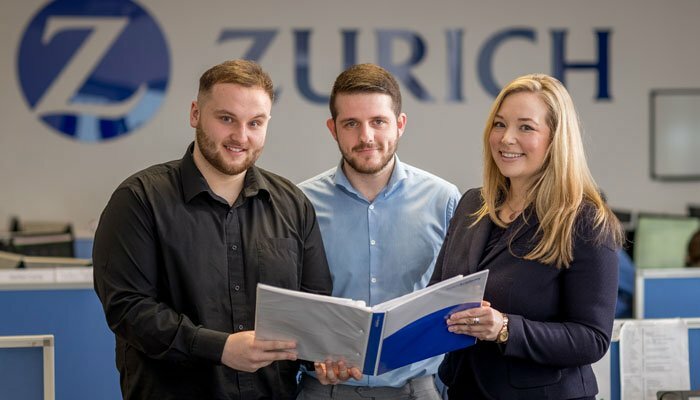 The Zurich Apprenticeship Programme is designed to offer school-leavers and job seekers the opportunity to secure a three year training and development opportunity with Zurich at its centre of excellence in Wexford. The Apprenticeship, which is accredited by the Insurance Institute of Ireland (III) and Sligo IT, is now available for online applications.